Cantus Juvenum Karlsruhe, Philharmonia Chor Wien, Münchner Philharmoniker / Stefan Soltesz. Stage director – Philipp Himmelmann. Festspielhaus Baden-Baden, Baden-Baden, Germany. Monday, May 16th, 2016. Sometimes it takes an exceptional performance to make a cogent case for a work hitherto considered weak. This is precisely what we got at Baden-Baden tonight. This was a cast that had been hand-picked with care and we were rewarded by solo singing that was almost unanimously of outstanding quality, combined with an intelligent production, choral singing, orchestral playing and conducting that really brought the work to life. This was without a doubt an extraordinary evening in the theatre. The fact that this was combined with the very special atmosphere of Baden-Baden made it even more of an evening to treasure. There is something so convivial about attending a show in this Black Forest spa town. After spending a day in this idyllic place, away from everyday pressures, one comes to the show refreshed and relaxed. 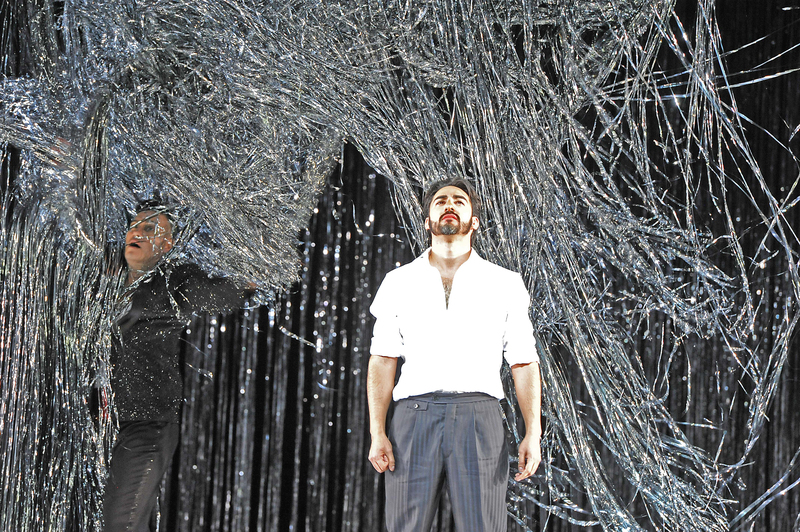 Philipp Himmelmann’s production really made much of little. If that sounds like damning with faint praise, it most certainly isn’t. Rather what he did was use what he had in an intelligent and illuminating way. 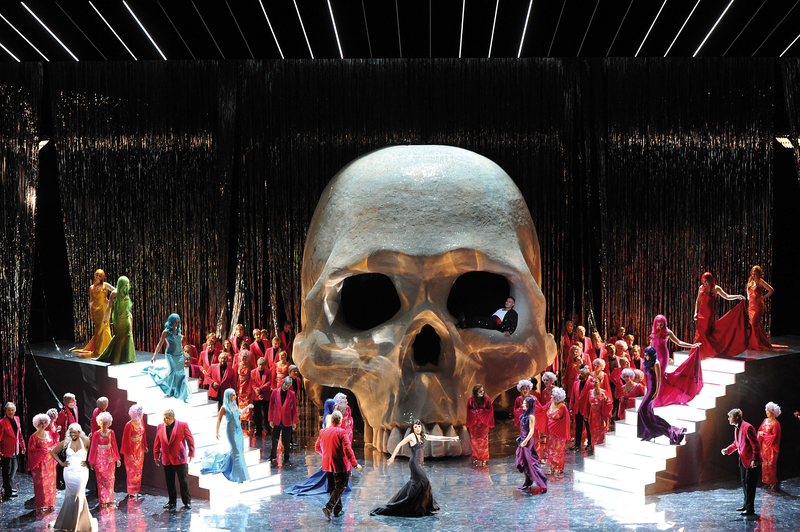 The set was very simple – a large skeletal head dominated the stage upon which were projected images relevant to the scene. For example, a blooming meadow in the first scene where Faust and Margherita appear together, transforms into of the fires of hell as Faust hands her the potion. 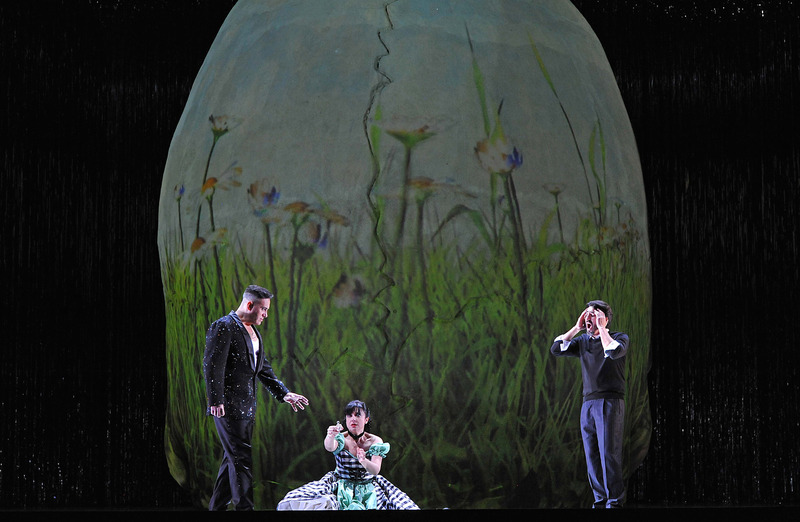 Video (Martin Eidenberger) was also used to illuminate the set and the curtain with images that showed the characters’ physical journeys from place to place, thereby illustrating the story in an engaging – but never overpowering – way, without the need for extremely elaborate set changes. 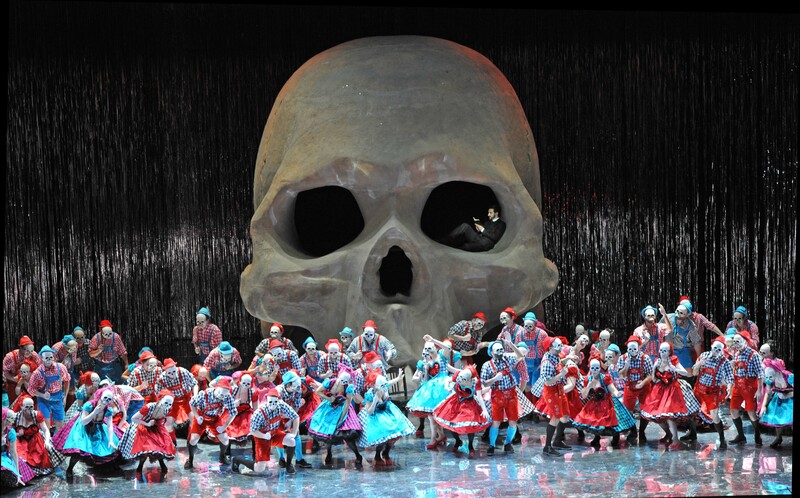 The variety of costumes (Gesine Völlm) used by the chorus, in an opera that gives them such an important role, allowed them to set the scene through their presence as much as elaborate sets would. Indeed, Himmelmann had evidently also directed the chorus with the same detail as he had directed his principals providing us with a set of clearly defined individuals and a corporate mass. Likewise, personenregie was extremely detailed and showed the characters’ journeys in a particularly clear way. Musically it really was a very special evening indeed. There is something incredibly rewarding about watching a familiar singer hit the next level and give us a consummate and total performance of a kind one hadn’t heard from him or her before. Tonight, Charles Castronovo did precisely that. I’ll come straight out and say, having had some exceptional evenings in his company, tonight really was the best I have heard him sing. The role fits him like a glove in a way that it sounds like it could have been written for him. Right from his very first entry, one immediately knew that this was an incomparable voice. Moreover, his vocalism felt so absolutely secure so that one knew that whether he would dare to sing an extremely soft pianissimo or hit some ringing high notes, the voice would absolutely deliver. And how! His tone is so Italianate and warm, with a gorgeously smooth legato, and he is an also engaging actor. 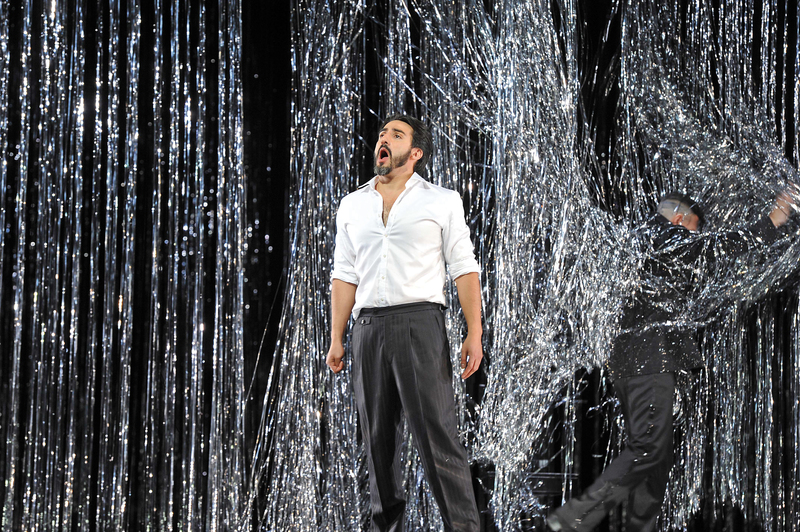 What also is notable about Castronovo’s singing is his complete command of the passaggio and this really does add to the sense of security his singing gives, with all the registers absolutely integrated. His soft singing with Alex Penda’s Margherita in the prison scene was absolutely ravishing. Penda was thoroughly devastating in that scene. She is a total singing-actress who combines voice and physicality in the most remarkable way. Her big set piece ‘l’altra notte in fondo al mare’ exemplified this approach. Sung in a voice that seemed almost suffocated she explored the lines lyrically yet opened up the tone where it was needed. This description sounds clinical but it was anything but. Her singing was so honest and brought her character so completely to life and she found incredible reserves of power towards the end of her scene, the voice ringing out through the theatre. This was without doubt the work of a master singing-actor. Angel Blue was a glamorous Elena, both vocally and histrionically. She worked it across the stage and sang like a goddess too. 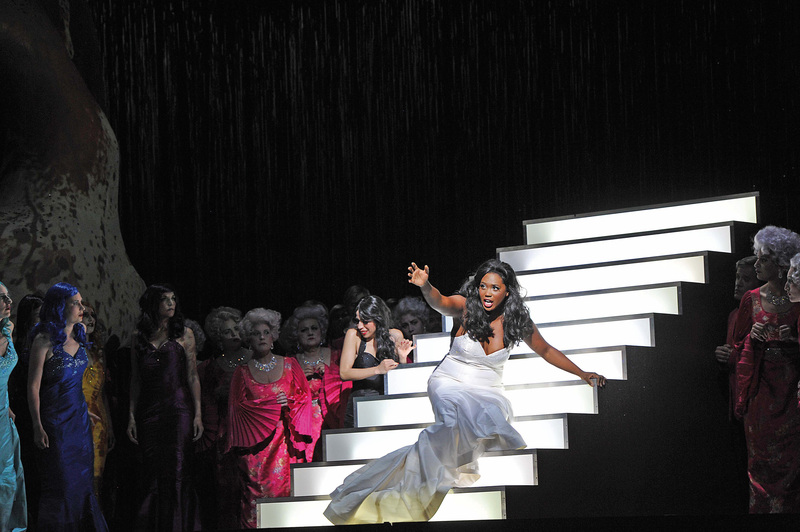 Hers is a big, round luxurious soprano from the velvety top to a full and resonant chest voice. Her singing was wonderfully uninhibited and always utterly musical. She is, undoubtedly, a very classy singer. She blended nicely with Luciana Mancini’s tart and resonant mezzo in their exquisite duet ‘la luna immobile’. Jana Kurucová’s full and vibrant mezzo was a pleasure to hear as Marta and Bror Magnus Tødenes revealed a delightful lyric tenor with impeccably Italianate diction as Wagner. 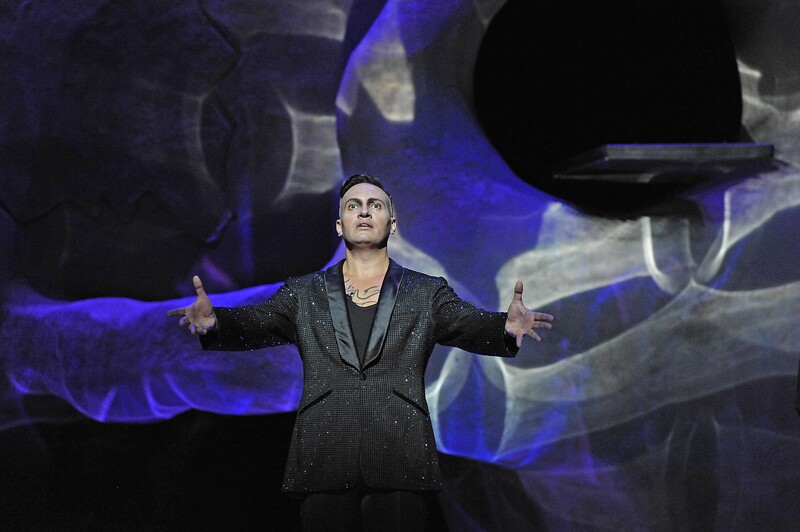 I have left Erwin Schrott’s Mefistofele until last. This I felt was more problematic. He certainly has stage presence and his acting brings the audience in. But that’s only half the story. For me there seemed to be a disconnect between the vibrant and gripping personality we saw and what we heard. He seemed to inject little of that personality into the text and lacked wit in his vocalism. Moreover it felt that he was pushing the voice so much that pitch started to become more approximate and towards the end of the evening it did not sound healthy. The voice is a good size and there is no reason for him to push it. He is certainly a witty and charismatic actor though. The Philharmonia Chor Wien gave us singing of absolutely glorious amplitude. In their final scene they were placed in the highest balcony, behind the audience, thereby bathing the theatre in a magnificent glow of choral sound. Yes, there were a few occasions where there were a couple of individual voices sticking out and yes, there were a few isolated incidents where the sopranos were flat. But to hear singing of this quality, far from the war of vibratos we are routinely subjected to in some other theatres, was such a pleasure. The youthful tone was extremely well integrated, the tuning in those tricky unaccompanied passages absolutely spot-on and the rhythm impeccably even. The massive sound they gave us was absolutely overwhelming. Likewise the Münchner Philharmoniker gave us playing of the highest distinction. Perhaps intonation in the cellos could have been tighter, but overall, they played extremely well. There was impressive depth to the string tone and the brass were absolutely on point throughout the entire evening. I have been quite critical of Stefan Soltesz in the past but tonight he really had the measure of the work. He led a reading that was swift and lively but still let those big moments register. There was also some intelligent use of rubato and he marshalled those big forces with ease. Tonight the case for Mefistofele was definitely made by a fine cast. It was sensationally sung by the two leading ladies and a tenor who tonight sang their roles like they were the only people in the world who could sing them. It was extremely well-conducted and given orchestral and choral playing of a truly rare quality. Combined with an intelligent and insightful production, this really was a phenomenal evening in the theatre. 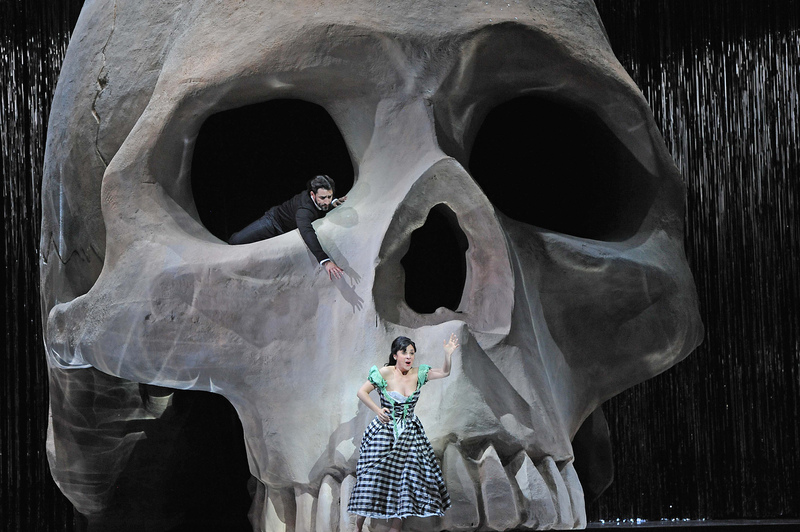 Thanks for a great review of a great opera (which surely doesn’t need a case made for it.) The pictures give a vivid impression. Having seen the woeful Munich production, I’ve learned it’s vital the producers have a passion for it. Then it becomes one of the most exhilarating works in the whole repertoire. Seems like that was what you got this time! Do you think they’ll have another run at Baden Baden? Hope so. Thanks for reading. It really was indeed an exhilarating experience last night. There were cameras there so hopefully a DVD will be forthcoming. Very insightful and, in my opinion, having attended last Friday’s performance, excellent review ! The prologue & epilogue were terrifically sung & staged; everything in between I felt was sublime & I agree completely on your observations of the particular singer’s performances. Missed the Radio 3 broadcast last Thursday afternoon of the Munich production as I was travelling but I doubt it could have been bettered. I second the request for a DVD release !! !